BOISE — Liquor licenses are a bit hard to come by here in Idaho, at least for now. But a new piece of legislation at the statehouse could make it a little easier for some businesses to obtain one of those precious licenses. 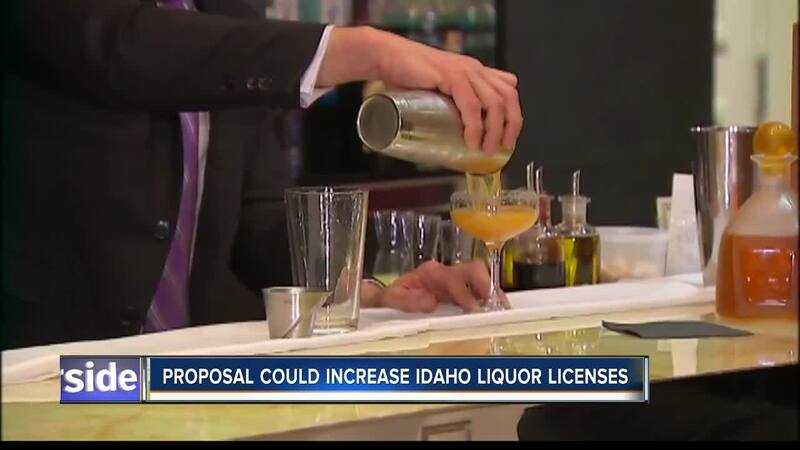 Currently, there are 1,118 liquor licenses in the state of Idaho, that’s according to the Idaho State Police Alcohol Beverage Control who said, “Every incorporated city is allowed two liquor licenses. Larger cities can have one liquor license for every 1,500 residents.” Most of those licenses are claimed, leaving no licenses available to incoming businesses; and if they are able to get one, they come with a high price tag. This new proposal, however, would create an unlimited amount of licenses, at least for restaurants. "They'll be issued by cities and counties and so a city that doesn't want to have liquor licenses doesn't have to, a county that doesn't want to doesn't have to, it also sets a process so the citizens by initiative could change that," said Senator Jim Rice. Those already existing licenses, or legacy licenses, currently carry a hefty cost. "They can run up to $250,000, they have sold for higher, Ketchum, Sun Valley, they're very expensive. In Arco you could get a new issue license for $600," said Kevin Settles, Owner of Bardenay in Boise. That's because the licenses are transferrable, and demand for them is higher in places that bring in more tourists or house more people. The current quota system allows a new liquor license for an additional 1,500 people in a city. But a big worry for restaurant owners, if more licenses are added to the pool, is the value of current licenses decreasing. "A lot of times people have had to go out and get loans for those licenses. If the value of those licenses drops down, the banks could certainly call and say 'hey we don't have the collateral that we thought we had with that license now'," said Brad Selvig, Owner of End Zone in Boise. So it's as important as ever for these restaurant owners, that any proposal preserves value. "What I like about the current bill is it deals with this problem of the quota system, but retains some of the value for the licenses for some of us that have bought them under the current system," said Settles. But it's nearly impossible to retain all of the value. If a restaurant owner were to sell the license, demand would be lower, appealing only to bars and those restaurants who want to be able to close the kitchen down for certain hours of the day. "Short of them writing each one of us a check, there's no real way to make us whole. They have thrown out some ideas of a discount at the liquor store, that would take 20-years to recover the cost of what I have in that license," said Selvig. That discount offers around 10% off liquor purchases. "What they're after is to try to keep the price really high, keep the competition really low, but nobody has a right to a state-created shortage that favors them," said Rice. Those restaurant owners argue, that state-created shortage could turn into state-created downturn if not handled correctly. A hearing on this new proposal could be scheduled for as early as next week.